The Wrangler National Finals Rodeo is just under two weeks away! Remember to stop by and say hello to the Tough Enough to Wear Pink team if you’re headed to Las Vegas for the big event. Don’t forget to pack your pink! The Thomas Mack Arena will be awash in pink on Monday, December 5, for Tough Enough to Wear Pink Night. Can’t make it to Las Vegas for the WNFR? Follow along online and watch daily at home! Visit the Pro Rodeo site for the official schedule and check your local listings. 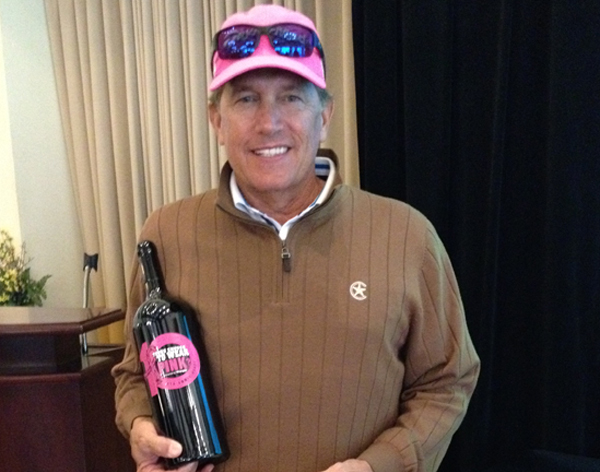 Purple Cowboy is the official wine of the Pro Rodeo Cowboy’s Association and proud supporter of Tough Enough to Wear Pink, sponsored by Wrangler. 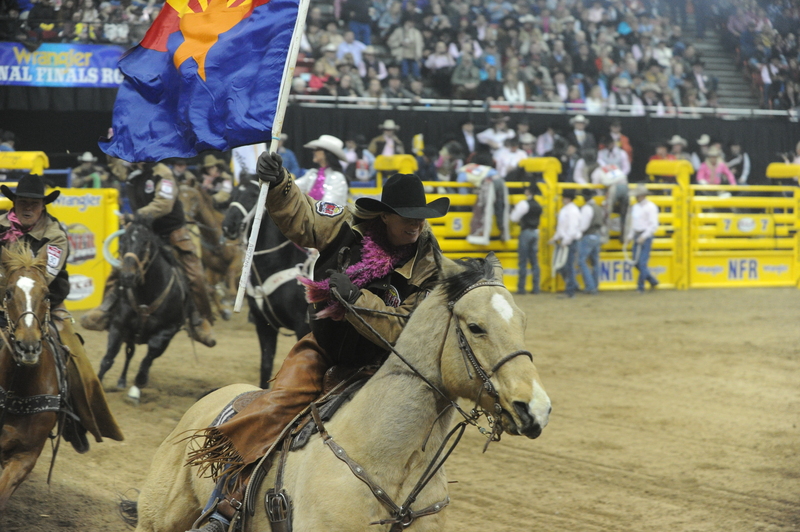 We’re pleased to announce that the Wrangler National Finals Rodeo takes place December 3 – 12, 2015 in Las Vegas, Nevada! Can’t make it to Vegas? Watch the action live each night on CBS Sports Network from 10 p.m. – 1 a.m. (ET) every night. Tune into Dish: Channel 158; Direct TV: Channel 221. Or check your local listings. OR catch up on each day’s action online at 6 p.m. Pacific nightly on ProRodeoLive.com and Rural Radio Sirius XM 80, with Steve Kenyon and Wade Wheatley. Join Tough Enough in Las Vegas at the Wrangler National Finals Rodeo, starting this Thursday, December 3 through December 12! And don’t forget to wear your pink for Tough Enough to Wear Pink Night on December 7 at the Thomas & Mack Arena. While you’re at the Wrangler NFR, stop by and shop the Tough Enough Booth #770 at the Sands Expo Country Christmas and be sure to visit the Tough Enough trailer at the Thomas & Mack Arena. Enter to Win Tickets to the Wrangler NFR! Boots, spurs, and horse trailers… cowboys are taking over Las Vegas again this December! Why? 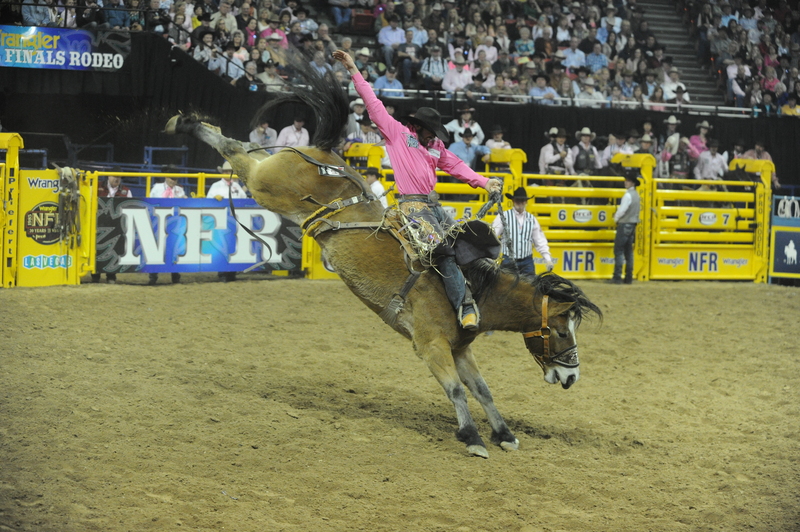 The Wrangler National Finals Rodeo is riding into town again, December 3-12, 2015. 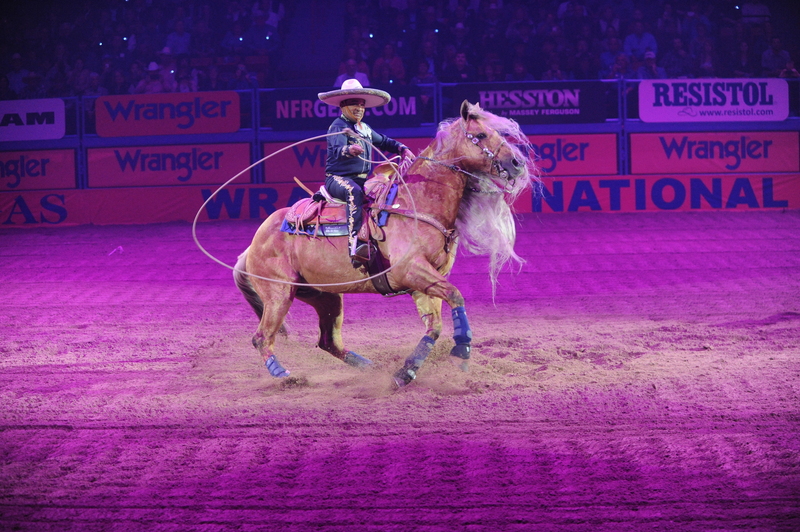 As a fan of Purple Cowboy, you have a chance to enter to win tickets to the rodeo of the year. The Gold Buckle Challenge is back! “How do I win?” you ask. Well, it’s easier than you think. Simply subscribe to the Purple Cowboy newsletter where we dole out the latest news, recipes, wine pairings and more about the Purple Cowboy wines, the official wine of the Professional Rodeo Cowboys Association (PRCA). Ready to go? Those NFR tickets sell out quicker than you can say “Purple Cowboy,” but we can get you there in style. Our Gold Buckle Challenge winner will get some of the best seats at the NFR and your airfare and lodging are covered courtesy of Purple Cowboy Wines. Already subscribed to the newsletter? Great! You will be automatically entered in the Challenge. We wish you the best of luck! The Challenge continues until October 1st, 2015 when we randomly draw a winner for the sweepstakes. You can read the official contest rules here. The George Strait Tough Enough to Wear Pink Golf Tournament has become a Wrangler National Finals Rodeo tradition. This year the tournament raised a whopping $15,000 for the Susan G. Komen Foundation, dedicated to breast cancer awareness education and research about causes, treatment, and the search for a cure. Watch the video above produced by Cowgirl Magazine, including interviews with Tough Enough co-founders Terry Wheatley and Karl Stressman, PRCA Commissioner, about how the organization began and where it’s headed. 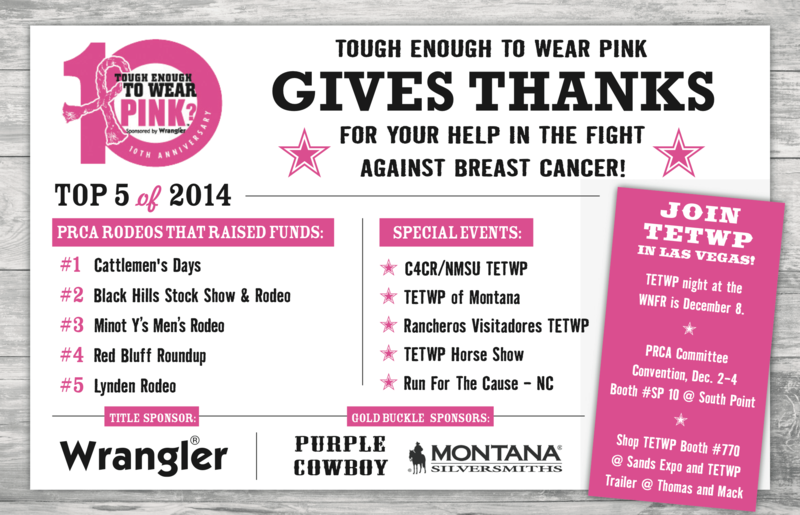 Once again, big thanks to George Strait, Wrangler and PRCA for their support of Tough Enough to Wear Pink! View more photos from the tournament on the Wrangler Facebook Page here. Join Tough Enough in Las Vegas at the Wrangler National Finals Rodeo, starting this Thursday, December 4 through December 13! And don’t forget to wear your pink for Tough Enough to Wear Pink Night on December 8 at the Thomas & Mack Arena. While you’re at the Wrangler NFR, stop by and shop the Tough Enough Booth #770 at the Sands Expo and be sure to visit the Tough Enough trailer at the Thomas & Mack Arena. And, don’t forget that our Purple Cowboy endorsee, Trevor Knowles is headed to the Wrangler NFR in the lead in steer wrestling with $91,804 in total winnings. Get his autograph at the Steer Wrestlers WNFR Autograph Session from 12pm to 2pm on Friday, December 5. Keep an eye on the schedule of events and watch Trevor compete live! And check out our recommendations of top things to do while in Vegas here. This year, Tough Enough to Wear Pink is proud to have raised more than $20 million since we began 10 years ago. We are proud of the more than 300 rodeos and events that participate each year. We are proud of Wrangler, the title sponsor of this campaign. And we are proud of the cowboys and cowgirls who have made this campaign their own. Watch the video above to listen to a special message from Tough Enough to Wear Pink co-founder, Terry Wheatley. We’ll see you at Tough Enough to Wear Pink night at the Wrangler National Finals Rodeo on December 8! Learn more about the story behind Tough Enough to Wear Pink here. On this Giving Tuesday, we want to thank everyone who has helped support the fight against breast cancer this year! Can’t be there in person? Watch the action live each night on CBS Sports Network from 10 p.m. – 1 a.m. (ET) every night. Tune into Dish: Channel 158; Direct TV: Channel 221. Or check your local listings. Check out our recommendations of top things to do while in Vegas here.